by Enstice and Stockhouse. 400+ page Hardback book with CD. 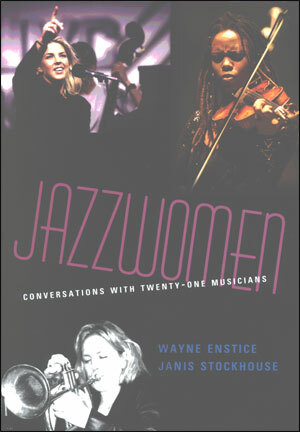 Jazzwomen includes 21 great Female jazz artists who are not covered in earlier books and also reveals new information about artists who are. In addition, the interview format provides the reader with each artist’s own words, permeated with a warmth and immediacy not typically found in author narratives. Their candid conversations range far beyond biographical – their feelings, relationships, motivations, musical approaches, sexism on the bandstand, and attitudes. Captivating interviewees include Marian McPartland, Regina Carter, Abbey Lincoln, Cassandra Wilson, Diana Krall, Jane Ira Bloom, Maria Schneider, Virginia Mayhew, and many others. Sampler CD includes complete works by several of the artists.